Debbie (far left) is onebestway's copywriter. When she's not writing onebestway websites and brochures she's writing scripts for The Bill, Casualty, as part of Lynda La Plante's writing team and the Eastenders and Coronation Street writing teams too. We think it's nice that someone with that quality and experience is used to write promotional materials for onebestway clients. Businesses can be a bit boring sometimes with how they communicate themselves you see. With a commissioned scriptwriter, that's just not the case. 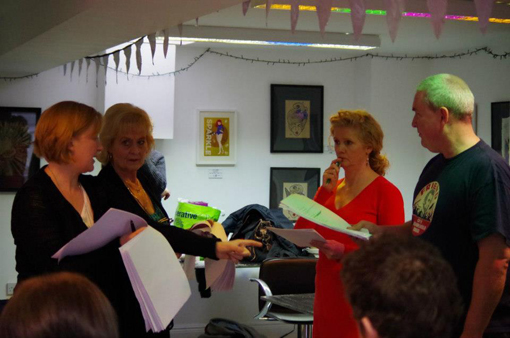 In the image above Debbie is Directing a play by a writer who's just completed the LIVE Theatre's Writing Course. They had nine hours to rehearse before the performance at The Bridge Hotel in Newcastle. This play was the first of seven. Ten characters; thirty minutes long and a fabulous cast of professional North East actors. Everything's that little bit more interesting in the world of onebestway, including every single word that appears on our client's websites, blogs and brochures too. It's a little blurry. 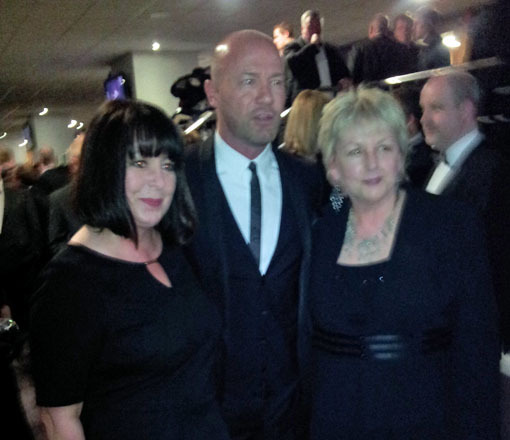 But then that's probably the champagne at the NUFC Foundation Hall of Fame event. Steph (left) and Lesley (right) are the founders of the North East's most significant and effective Supply Teaching Agency, First Class Supply. Their seven figure turnover and 12-strong team is growing fast. First Class Supply is also the only major sponsors of the NUFC Foundation. And so it's only right that the time, finance and energy that Steph and Lesley put into supporting this amazing cause is rewarded with a little bit of Shearer-time. First Class Supply is massively proud to be supporting The Newcastle United Football Club Foundation (especially as they get to meet Newcastle's number 9). And onebestway and Violet Bick are massively proud to be supporting First Class Supply, the North East's Number 1. Here's how The Chronicle covered the event, too. Thank you for taking a look at this onebestway Job Opportunity. onebestway is a fine little design and marketing agency that's amongst the top ten most established setups in the North, now. We launched in June 2000. And as our client brands get bigger and stronger, our team needs to follow this trend too. There are 15-20 people across all of our teams, by the way (but we are growing a little bit). This Account Manager role is a tricky one for us to fill. You'll be engaging with and advising some great businesses, potentially from all over the UK, so you really do need to be extremely good at what you do. Convincing. Compelling. Clever and genuinely effective, too. You'll be likeable, personable and engaging of course, too. You will be able to think both strategically and tactically about marketing and, supported by Project Managers and a growing, award winning Creative Team you'll help our customers to become more profitable. We are simple beings that clearly appreciate beautiful design and marketing communications, but our real focus is effectiveness. In summary, we use design and marketing to make our customers more money, not just to make them look a little better. So, if you are an experienced Account Manager with at least 3 years of really impressive performance in our industry then please email mike@onebestway.com with a brilliant covering email and a bang up to date cv. The remuneration package for the right person, that delivers in the way we require, is genuinely sector-leading. Please have a good read of onebestway's holding page, media links, blog and associated businesses (Violet Bick and angelfysh) to fully appreciate how and what we are doing at the moment. The British Franchise Exhibition is the only BFA-accredited franchise exhibition in the North. This year, I've been asked to pop down to Manchester and tell wannabe business builders the onebestway, Violet Bick and angelfysh story. Karren Brady, Lord Alan Sugar's left hand woman on the BBC's Apprentice. So I guess that one of the main questions I'll be asked by the few hundred people I'll be chatting to is, "err; who are you?" Ah well. I'll do my best. I'm quite looking forward to it actually. And it is nice to be asked.